Its designed with a thinner (.018") section to keep it light and flexible. The first vertical section of the vane is thicker for added vane stiffness and durability. Ribs channel the air vortex, making the vane control the arrow more efficiently. New "Elastimax" material surpasses all other vanes with its toughness, durability, and adhesion. 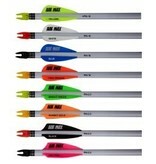 The Plastifletch Max 2.0 sield-shaped vane adds another size for archers who want a 2-inch low profile vane.